Fishing around Sooke and Victoria has been quite good lately, with anglers finding success with both salmon and halibut. 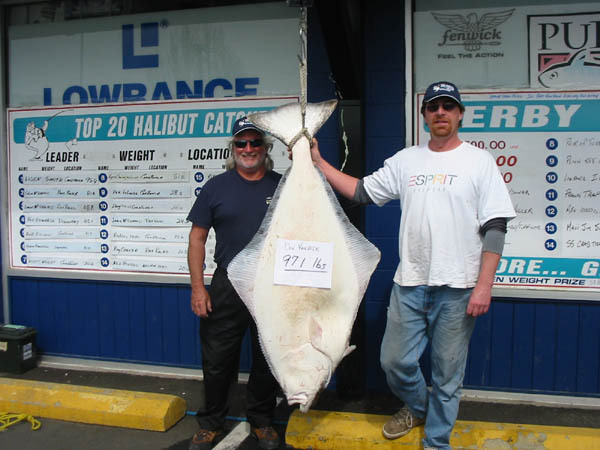 In Victoria, last weekend saw the annual Island Outfitters halibut derby. Good weather and good tides made for some good fishing. 149 halibut in total were caught, with a 122 pounder taking the $7,500 top prize -- caught by a Sooke fisherman, Syd Spooner. Cliff & Don were out fishing with Foghorn Fishing Charters, for the 8th year in a row, and took home 5th and 8th prize. Farther west, Jolly Rogers tried his luck for halibut at Jordan River, reporting it pretty slow, no bites in a few hours. However, he caught a 15 and 2o pound Spring salmon at Sheringham Point on the way home. Not bad for a consolation prize. Hindsight Fishing also did well for Spring salmon at Sheringham earlier in the week. John reports Trap Shack was good mid-week, with salmon up to 20 pounds, but has slowed in the last few days. Jamie & Aaron reported catching a nice 25 pound halibut right in front of Sooke Harbour, so they appear to be everywhere. They also hooked into a big Spring salmon, towards 25 pounds, off Possession Point. It was wild, so they released it, but a nice fight. It was a "fatty", a football-shaped "Columbian". Lure of choice was anchovie in a glow green teaser head. Finally, Chris Brotherston and his rookie harpooner Jason Hardy caught a nice 56 pound halibut off William Head. 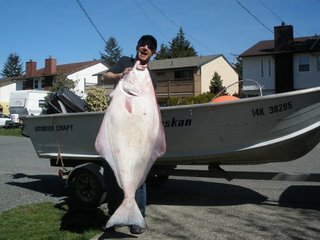 It was Chris' first halibut in his boat, a 14 foot Smokercraft. He caught it with octopus, fishing off of home-made coat hanger spreader bar. Jason's first harpooning was a perfect shot, in the thick meat right behind the head. Small boat, small budget, big results...great job! Winning against the odds makes the prize all the tastier. Awesome! Good times, fishing in and around Sooke and Victoria.